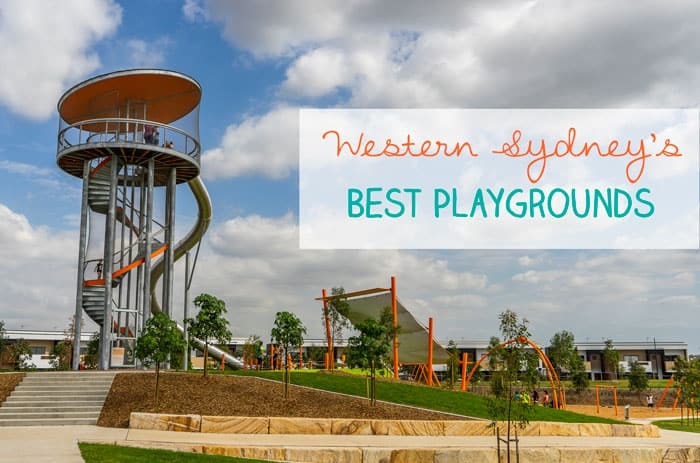 Western Sydney's Best Playgrounds - 15 and counting! Please welcome guest poster Rebecca from the terrific blog Little Munch, my very favourite blog about eating out with kids in Sydney. Rebecca writes really detailed posts, with everything you need to know before you visit cafes with kids. 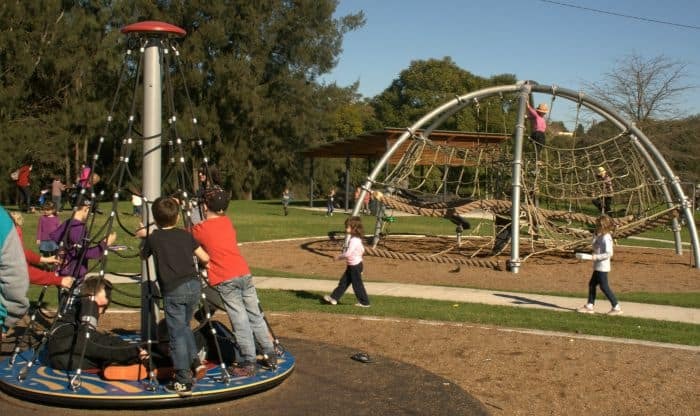 Here’s Rebecca’s list of her family’s favourite playgrounds in Western Sydney. They’re listed alphabetically by suburb. Can you add to it? 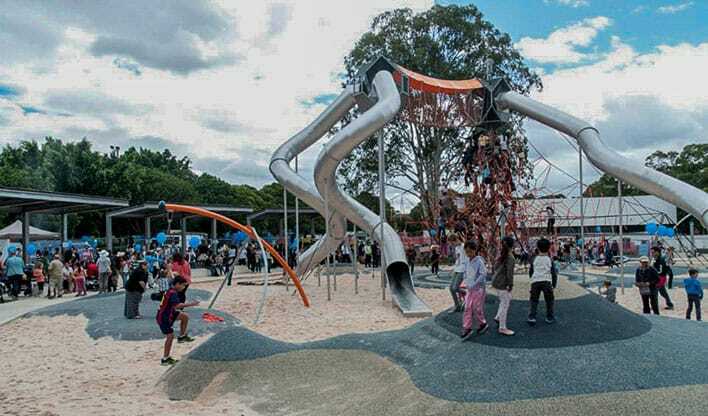 The one thing that Western Sydney has is a fair bit space – so there are some seriously good playgrounds to be found in most suburbs out here. 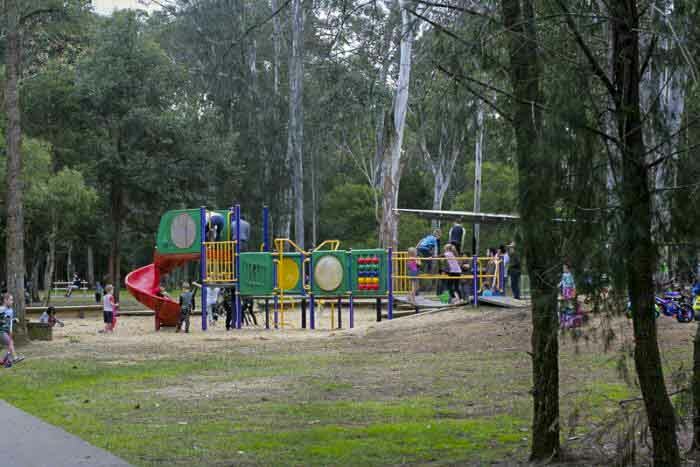 From large bushland parks to suburban playgrounds there are so many to explore. 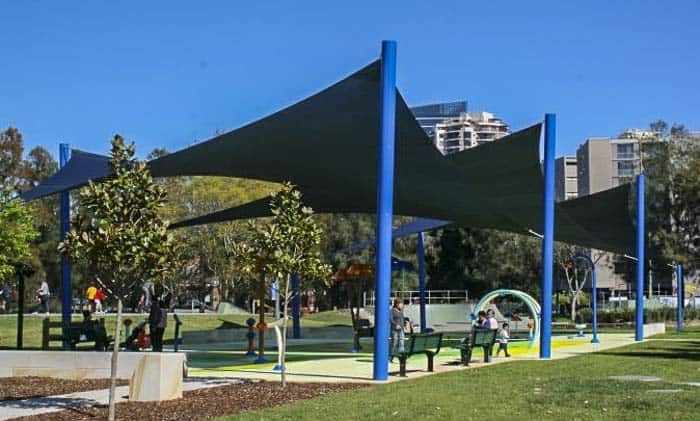 And, of course, these playgrounds are founds in the best parks in Western Sydney, so if you are searching for parks as well as playgrounds, read on. 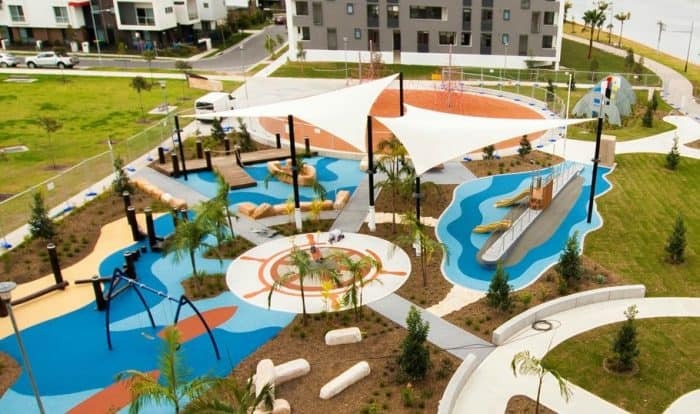 So slip slop slap everyone, and head out west to enjoy some of these awesome playgrounds! 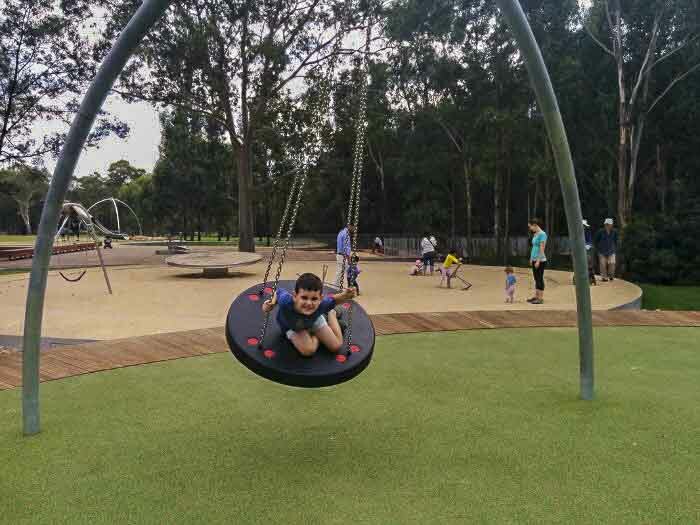 There is so much to love about this awesome playground that is part of the Western Sydney Parklands. It has equipment for all ages and it right next to a restaurant that also has kiosk where you can totally caffeinate yourself! See lots more photos of Plough and Harrow and read more details on the post here. Flying foxes, giant swings, slides, balancing beams, water play, and a cycle way – if you haven’t been you really should! 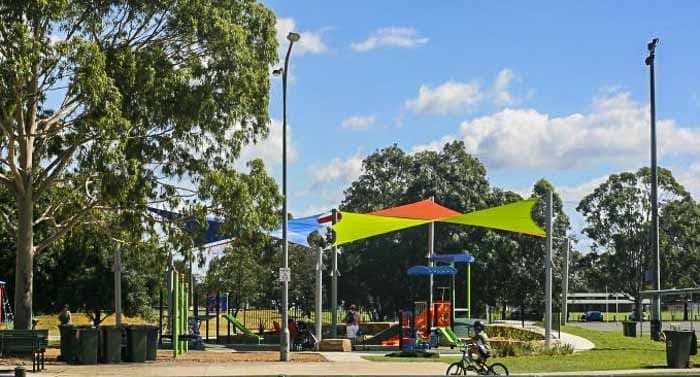 It’s in the Western Sydney Parklands, the largest of all the parks in Western Sydney, just like Plough & Harrow playground above. And there are picnic spots galore. Read Seana’s review of Lizard Log playground here. This is also one of the loveliest picnic spots in Western Sydney, you can really make a day of it… but beware, it does get very busy. So this is actually a garden and not a park (but let’s not get fussy) as it covers almost 10ha in outdoor space and includes two lakes, a waterfall, bridges over duck ponds, pretty gardens (especially in Spring), a maze, fauna reserve and it has a playground – which is a tad dated in comparison to the other super duper cool playgrounds listed in this article. So I think we can safely call this one of the nicest Western Sydney parks. This is one of the best Western Sydney playgrounds. It is part of the Blacktown Showground Precinct and has everything from a community garden to train spotting available in it. There are actually 3 different playgrounds within the park. 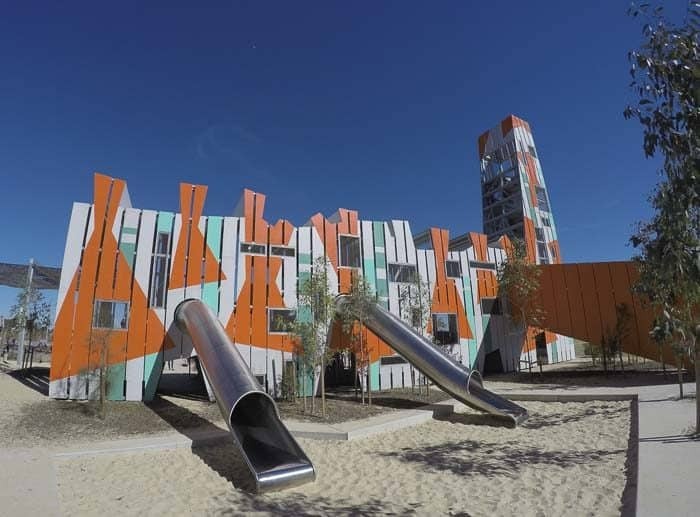 There is a fabulous all ages water park that operates from spring to autumn; a junior playground for little kids that has swings, balance beams and so many climbing apparatuses; and the senior playground for big kids has a flying fox, slides, things to climb on and over plus loads more. There is a ton of space to ride scooters and bikes and you can pack a picnic to enjoy at one of the many shelters scattered throughout the park. Or if you can’t be bothered bringing food from home, grab a bite to eat in the café that is on site. 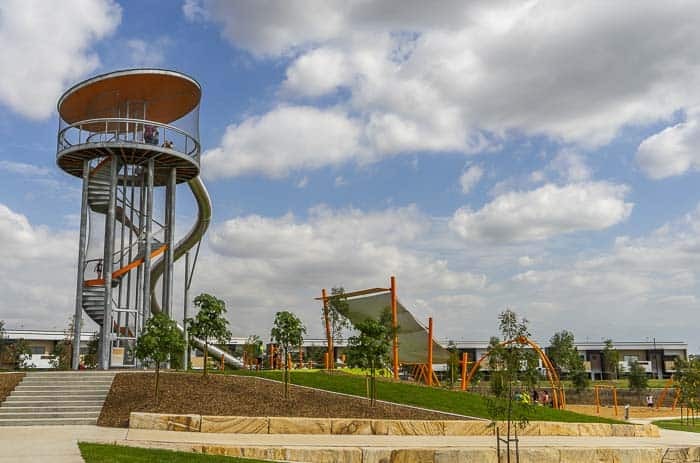 With its huge 14m high climbing tower, this is one amazing playground. There’s also a wonderful water play area, seesaws, long flying foces and much more. Probably the biggest playground in Western Sydney. When you plan your trip, read more details and see more photos about this seriously awesome playground here! This 63 ha. reserve has so many hidden delights within its parameters. 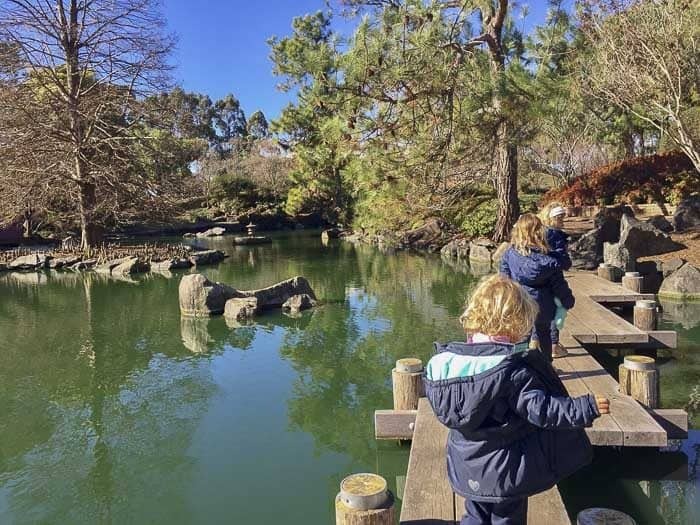 There is a stunning Chinese garden, a beautiful lake where you can feed the ducks, a small waterfall, 4 different playgrounds and a kiosk that is open every day. The playgrounds within the reserve are spaced well apart and you can easily walk between them, or drive if you have a sleepy little one in the back of the car. Most of the playgrounds have your typical equipment, but the one that will excite kids the most will with be the water splash park. Under the protection of sun sails, the brightly coloured splash park will keep your kids occupied for hours – but be warned it is very popular in the warmer months, so arrive early! This park has lovely views of the Parramatta River. The nautical themed play equipment is suitable for kids under the age of about 9 years of age. 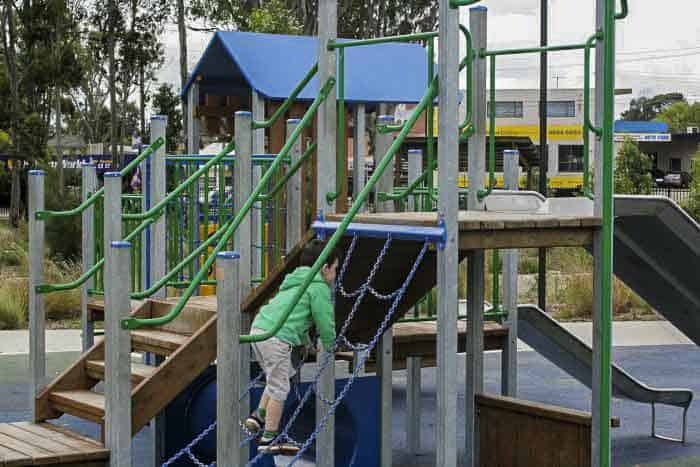 You will find your usual playground equipment such as swings and slides as well as some climbing frames, whirly gigs and loads of things for little people to safely climb up and over. 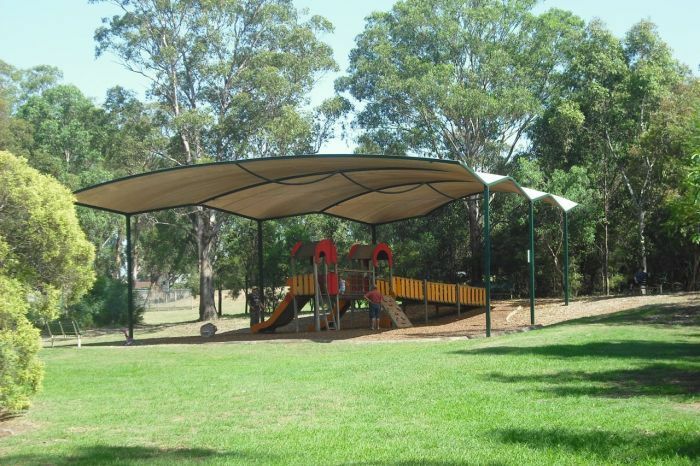 There are shade sails that offer some sun protection but you won’t find any toilets or picnic facilities here sadly. On the first Saturday of the month, the delightful Market By The River is held here as well. I think it’s pretty safe to say that this is one of Sydney’s coolest playground! 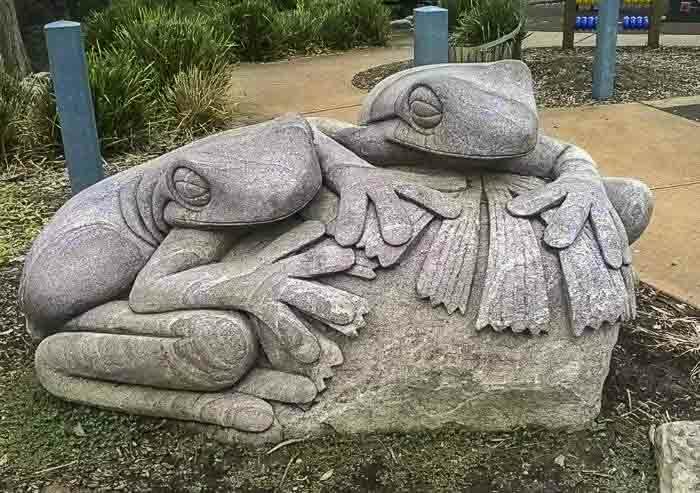 Fairfield City Council spent a whopping $1.4 million creating this masterpiece. With a huge climbing tower, freaky looking slides and more, this playground is an awesome way to keep your older kids happy in the holidays. For more information, amps and info on parking, plus more photos of Fairfield Adventure park, click here. 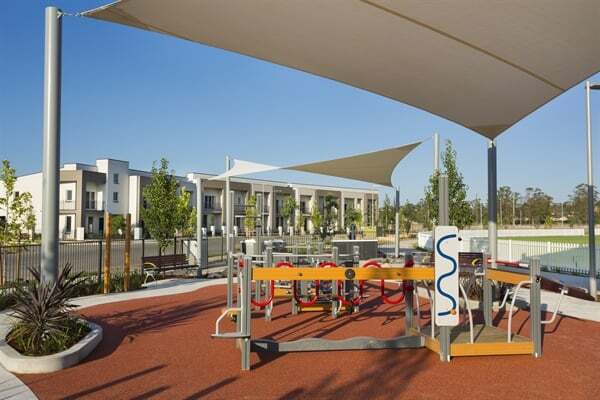 Being located right next to a lovely cafe is a major drawcard of this playground, as is the modern playground equipment that is kept spotlessly clean because it sits alongside a childcare centre. Swings are there of course, as is a large sand pit, slippery slides, climbing frames, mirrors that distort the body, balancing equipment and a scooter pathway. Unfortunately the playground is rather exposed to the sun, so if you visiting in the summer months plan your visit to arrive early in order to avoid the heat. This new park (Sept 2017) honours James Cook’s journey to Australia onboard his ship the Endeavour. The whole design of the playground features elements that reflect the voyage, like a sandpit in the shape of Tahiti, boat sail like swings, rubber matting in a full sized outline of the 30m ship, and a kids ride that looks like a goat (as this four legged creature came on the ship with Cook to Australia)! With two playgrounds and animal enclosures, this is the ideal spot visit when you are light on cash but still want to give your kidlets a great day out – because it is absolutely free! For more photos, information and map, check this blog post about Central Gardens playgrounds ere. There are two playgrounds here, plus a great bike track. This area is one that is terrific for children of all ages, even very cool teenagers. 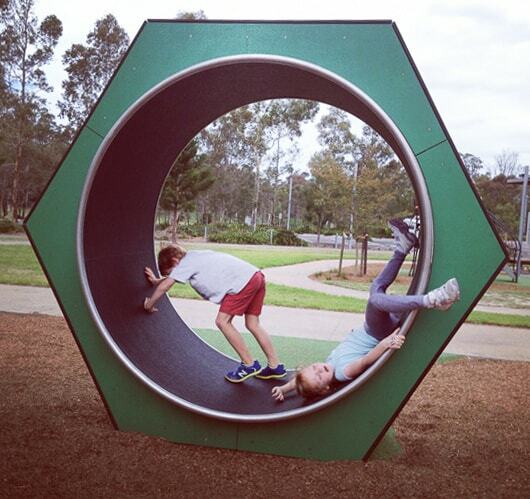 See Seana’s full post with photos about Holroyd Gardens playgrounds here. 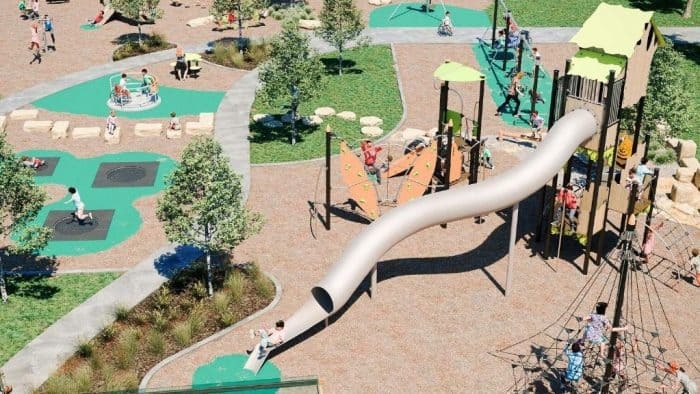 This action packed playground in south western Sydney has specifically designed for older kids to encourage them to get outside and be active more. There’s also some play equipment for young kids like swings and whirly gigs and of course there are scooter paths and loads of space to kick a ball and fly a kite. This huge and very modern park has great equipment for all ages, plus a cafe and views over the river. 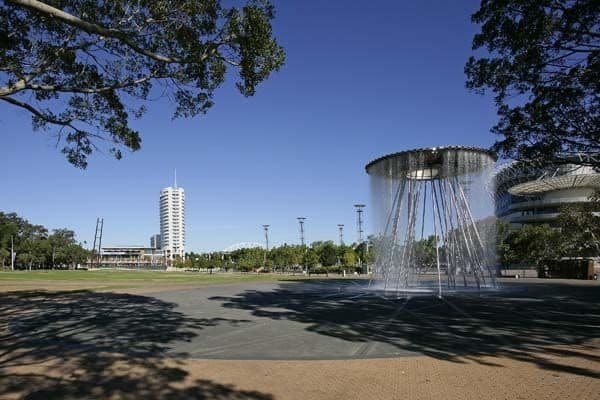 To plan your trip, check out this review Blaxland Riverside Park which has lots of photos, map and info on parking. If you like to get your kids out and about and into nature, then you will love a visit to Lake Parramatta and its playground. Set practically in the bush, the reserve has many activities such as bush walks, duck feeding and even swimming within its 75 ha. After you have finished exploring the lake and its surrounds, you can grab a take away from the café on site and head to the playground with the kids. The playground has a bike path, boulder climb, slippery slides, musical instruments, swings and even a mobility swing. Dotted throughout the playground are some pretty cool rock carvings of local wildlife, which kids will love to climb over. There are actually two playgrounds here, with the bigger one being best for young kids who are developing all of their “outdoor” skills. 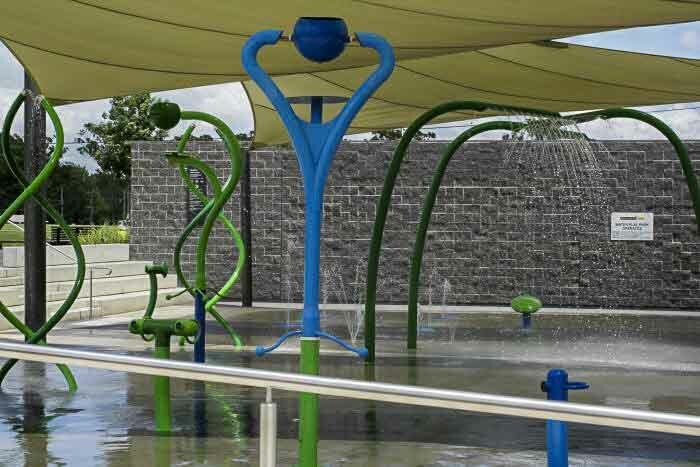 Kids will love the splash pad and all the equipment they can climb up and over. The smaller playground is actually completely inter-generational. In other words, it is for both older and younger people, especially those with mobility and coordination issues. There’s fitness equipment and other special apparatuses that target motor skills, coordination and balance. 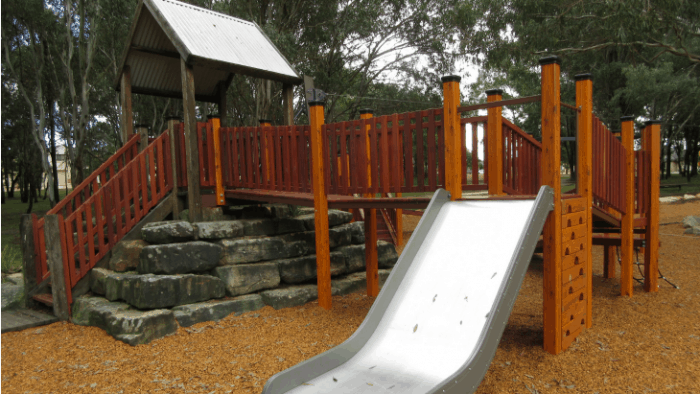 A newly upgraded playground, this nature style play space has a flying fox, a fortress, loads of things to climb up and over as well as a basket swing and play hut. 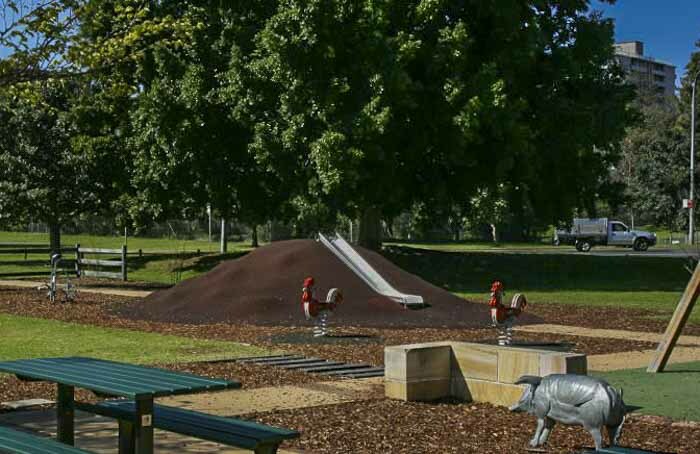 This park is home to the very grand Old Government House as well as a couple of delightful cafes and playgrounds. 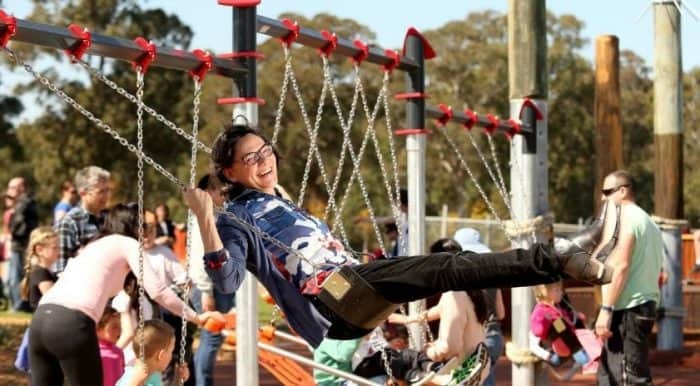 The brand new Domain Creek playground has also just opened inside the park, and it is home to some very snazzy playground equipment that kids of all ages will love. Read Seana’s original review of Parramatta Park here. One thing about Western Sydney is that it does get darn hot in summer! And instead of heading to the beach, locals can just cool down at the local splash park just like this awesome one in Parramatta. 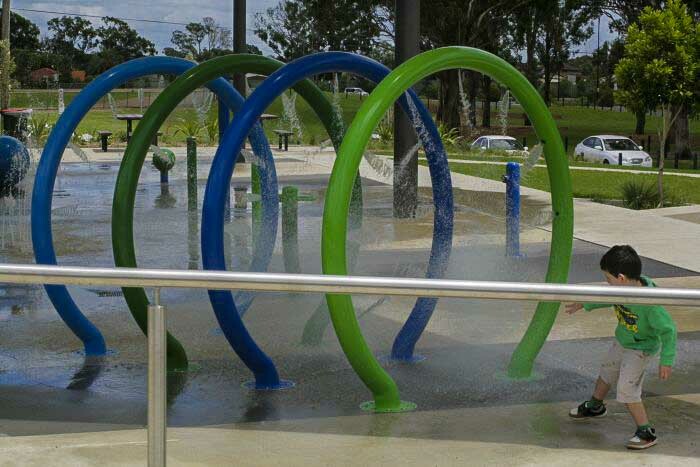 James Ruse Splash Park is relatively new and is a favourite of kids of all ages. There are water buckets, squirters and sprays that will keep kidlets cool and it’s all under cover which is a bonus. What isn’t under cover is the fab country style playground that is right next to it. This play area has spring loaded roosters, slippery slides (which may burn little bottomss in summer), climbing frames, swings and more. There is even a skate park right next to it, so throw the skateboards and scooters in the back of the car. Café: No – pick one up at Lil Miss Collins at 13 Wentworth Street, Parramatta before you go. If you have any little chimpanzees amongst your brood then this park is for them. 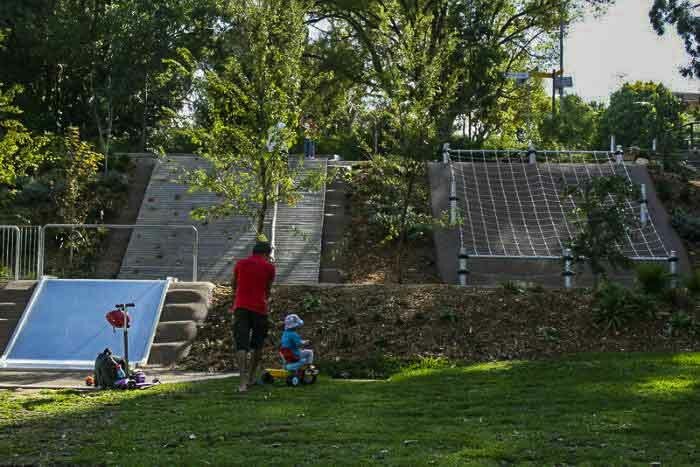 Located on the northern bank of the Parramatta River, this park is a little climber’s paradise. 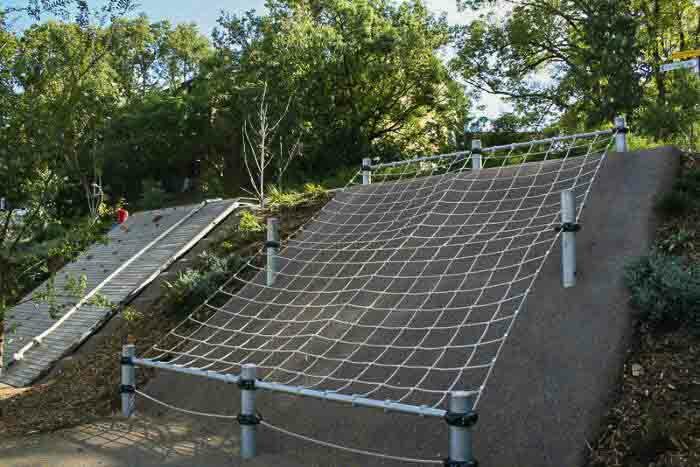 With super long slides that you have to climb up to get to, as well as commando nets and a rope bridge, kids will have loads of fun swinging from one to another. And don’t worry if you have any little safety Sams in the clan, they will have fun back down on Earth, pumping water into the sand pit. See more photos, a little video and find a map on the Hello Sydney Kids review here. This playground was completed in early 2018 and has some pretty groovy equipment, the highlight being the massive, massive slide. There’s a fenced toddlers play area, plus flying foxes, swings and more in the open area. The park here has a scooter track and space to run and play, plus BBQs and shelters. This is not an all abilities playground, unfortunately. 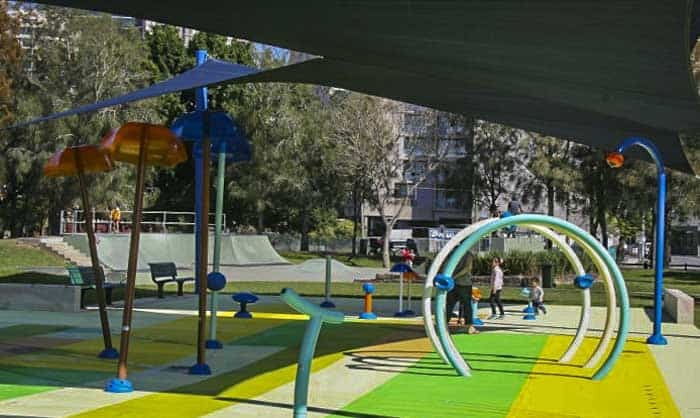 This brightly coloured playground will keep kids under the age of about 10 years entertained for a fair while. It’s only about 12 months old and it has a nice spongy ground, slides, swings, twirly gigs, climbing frame, scooter path and a crocodile, lizard and spider are lurking on the ground! Bigger kids might have fun kicking a footy at the oval next door or going for a hoon in the skate park that is also on site. And if you are desperate for a caffeine fix head diagonally across the road from the playground to the nearest café. 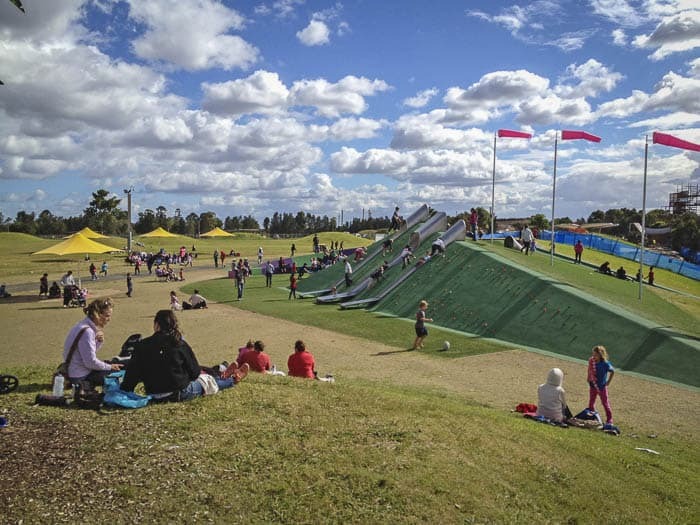 We think it’s the best of all the playgrounds in Penrith! 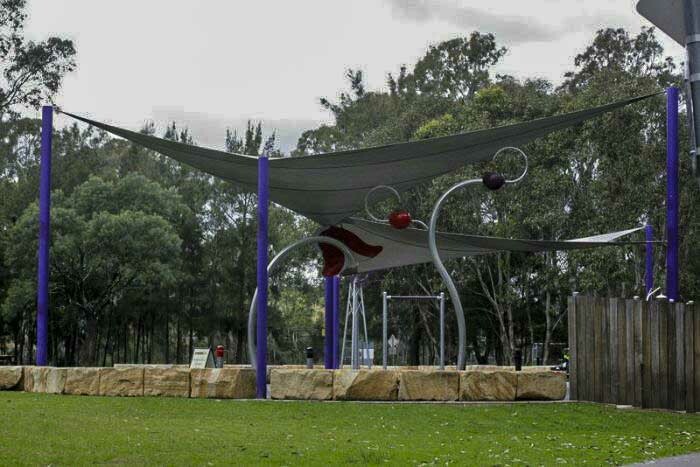 Another brand spanking new playground for Western Sydney, this huge playspace is located in the Camden area. 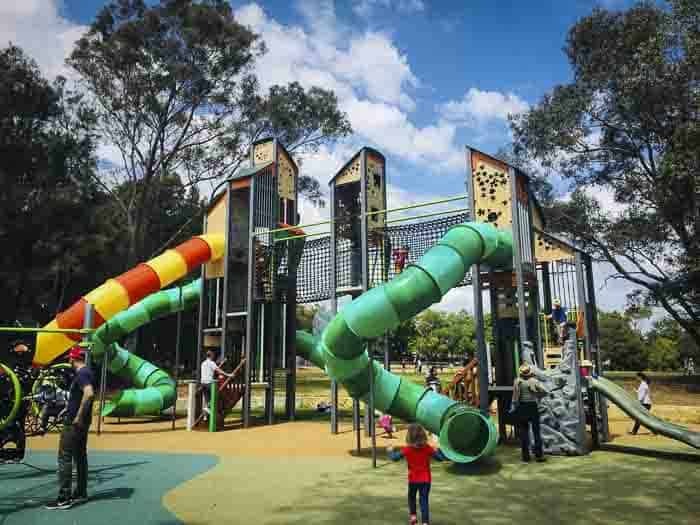 You will find equipment for toddlers as well as loads of fun things for older kids to play on like flying foxes, awesome slides, climbing equipment and see-saws. The playground is wheelchair accessible too which is a bonus. There are BBQ and picnic areas but unfortunately no loos! 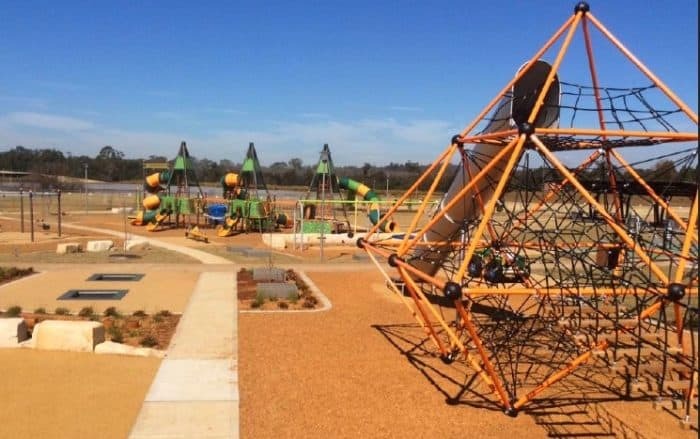 With magnificent slides and climbing fortresses, bike paths and so many different apparatuses to climb on and jump on and play on, this all abilities playground is a big hit with locals and is well worth travelling too. 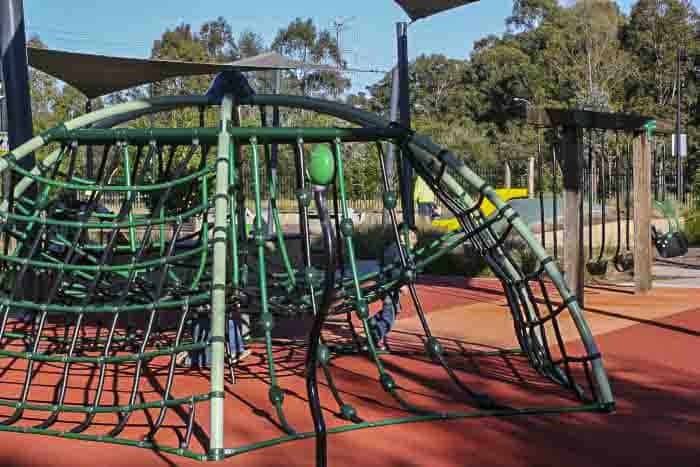 See the full Hello Sydney Kids review of Strathfield Park playground with photo, maps and parking info here. The iconic Olympic Cauldron is the centre piece of this fab space. When the water is turned on kids will love getting soaked (so pack a towel), and they will also love having fun in the play areas. You will find two playgrounds here, one for your little ones and one for your bigger kdlets. There’s heaps of beautiful green space to enjoy a picnic or just grab something from one of the nearby eateries. 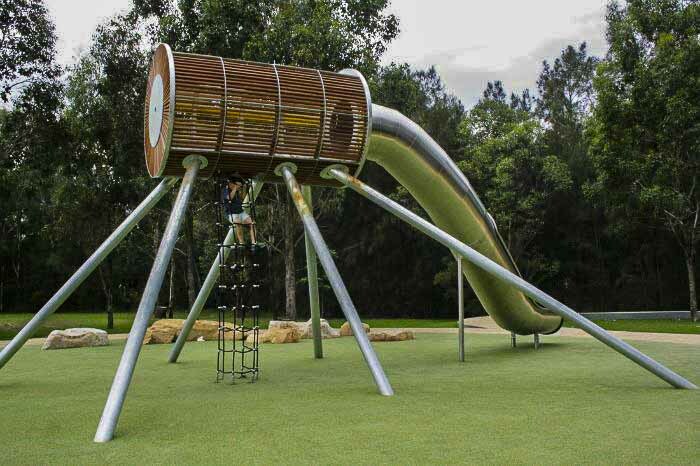 With a giant treehouse, in-ground trampolines, super slide, flying fox, climbing webs, wheelchair accessible equipment and toddler play equipment, this brand new playground has fabulous equipment for all members of the family. It has picnic facilities but sadly there is no sun protection as yet or loos! As well as fantastic playground apparatus, this playground has great views and artworks. This playground is full of brightly coloured play equipment and is right alongside a lake, the water is fenced but not the entire playground. There’s equipment for the little people and for bigger kids too. 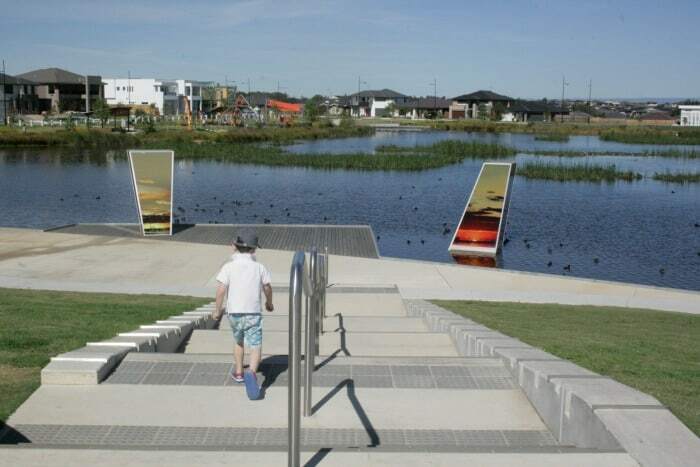 Werrington Lakes is a sprawling reserve that is home to a lake (obviously), cycle tracks, walking paths picnic facilities and outdoor gym equipment. There is also a pretty good playground with a water splash pad where kids will love to cool off after running amok in the park. 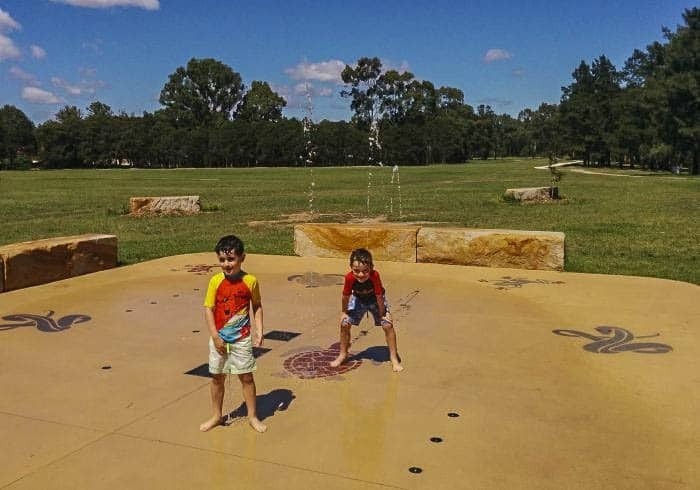 The splash pad is only small, but kids will still have loads of fun getting themselves wet. The playground is covered and has a fort, swings, things to climb up on, a fireman’s pole and other apparatuses to test out your kids balance and coordination. 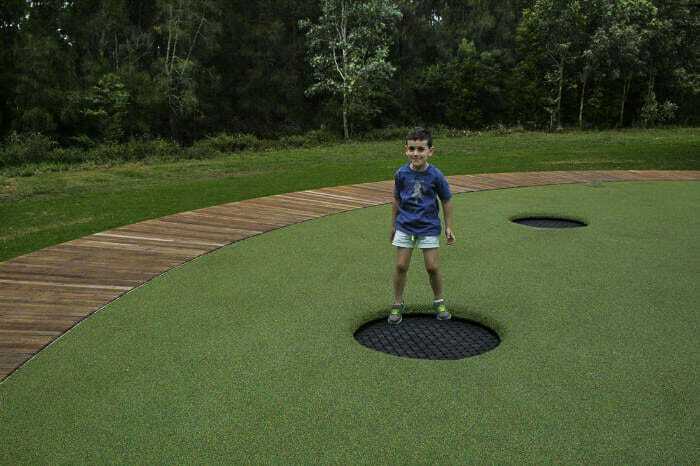 This park is located on the banks of the mighty Hawkesbury River – just across the Macquarie Bridge from Windsor. There is ample parking, excellent toilet facilities and if the weather is nice you can even go for a dip in the river like all of the locals do. 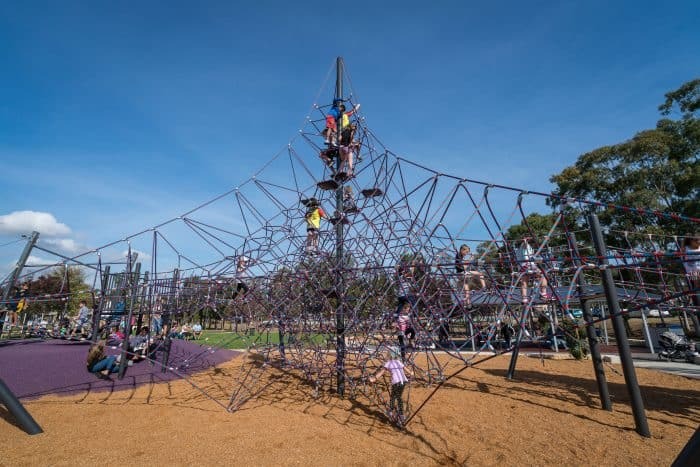 The playground facilities are perfect for kids of all ages with climbing frames, slippery slides, swings, bike paths and quite a few picnic shelters. You just need to keep an eye on wandering kids as the car park and playground are right next to each and there isn’t a fence between them. Also as the river is very easily accessible, you do need to keep your offspring in view at all times. The café on site is currently closed so make sure you drop into Café Red in Windsor to pick up a takeaway before you head across the bridge to the park! If you are looking for the best Windsor playground, stop by here. Read more about enjoying a full day of family fun in and around Windsor on this post. 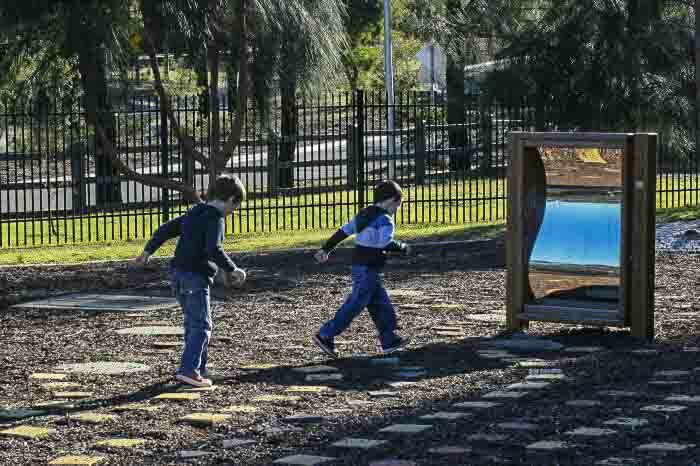 Are there any other fabulous playgrounds in Western Sydney that we have missed? I’m sure there are many more!